The Editors of FenwayNation have named Red Sox relief pitcher Ryan Brasier as their 2018 'Under The Radar' Award recipient—for under-recognized contributions to the team. The 31-year-old Brasier (who played briefly for the Angels in 2013) compiled a stellar 1.60 ERA across 33.2 innings of work in an otherwise often beleaguered Red Sox bullpen. The righty gave up just 19 hits and only six earned runs on the year and delivered a 4.1:1 strikeout-to-walk ratio. Opposing batters hit just .171 against Brasier—and he complied a solid WHIP of 0.77. Brasier was particularly effective in his last seven outings for Boston—with a 1.42 ERA over 6.1 innings of work. In that recent span, he gave up just one hit and delivered a minuscule WHIP of 0.32. His four-seam fastball averaged 96.8 MPH this season—compared with the MLB average on four-seamers of 93.2 MPH. He is likely to be a key relief option for Alex Cora as the Sox move ahead in the playoffs. 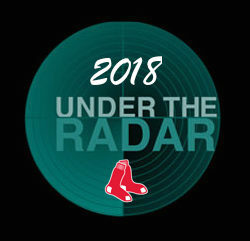 Congratulations, Ryan, on being FenwayNation's 2018 'Under The Radar' Award winner!